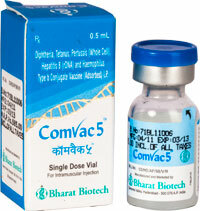 Comvac 5® is a uniform suspension of Diphtheria toxoid, Tetanus toxoid, B pertussis whole cell inactivated, Hepatitis B Surface Antigen and Hib PRP adsorbed on a mineral carrier Aluminium phosphate gel in isotonic saline solution (in-situ gel formulation).The Diphtheria and Tetanus components are toxoids prepared by formalin inactivation using established technology. The Pertussis component is a whole cell culture, inactivated by using standard methods. The Hepatitis B Surface Antigen of the Hepatitis B virus is manufactured by recombinant DNA technology. Hib PRP-TT Conjugate is purified Poly Ribosal-Ribitol-Phosphate conjugated to Tetanus Toxoid.